The Permian Basin is one of the most prolific oil and natural gas geologic basins in the United States. It is an engine of America’s energy resurgence and has been delivering resources for our vehicles, manufacturing, power generation and homes for many decades. Chevron and its legacy companies have been a fixture in the Permian Basin, which is located in the southwestern United States, since the early 1920s. In 2011, Chevron produced its 5 billionth barrel from the Permian. Today we are among the largest producers of oil and natural gas in the basin, and with approximately 2.2 million net acres (8,903 sq km), Chevron is one of the Permian Basin’s largest net acreage holders. The basin spans West Texas and southeastern New Mexico. Enhanced oil recovery techniques—first water flooding and then carbon dioxide injection—have had major applications in the Permian. The basin holds the largest crude oil fields in the United States, including more than 20 of the nation’s top 100 oil fields. The Permian is delivering transformational production growth as we apply advanced technologies and build drilling efficiencies to enable greater success in fueling America’s energy needs. The Permian Basin is approximately 250 miles wide and 300 miles long, across West Texas and southeastern New Mexico. It encompasses several sub-basins, including the Delaware Basin and the Midland Basin. “It’s our home. It’s beautiful in its own way … and I like it being taken care of.” In their own words, employees and community neighbors share their views of the Permian. The Permian Basin is delivering transformational growth for Chevron as we apply advanced technologies and build drilling efficiencies. Chevron’s longtime commitment to the Permian region results in a strong portfolio for future development. Our drilling program is expected to grow oil production over the next several years as technology enables greater success in finding and developing shale and other tight—or unconventional—resources. The Permian Basin’s geology is unique because it contains multiple “stacked plays,” which means one well can produce oil and natural gas from several layers of rock in different geological zones. This multiplies the basin’s oil and natural gas resource potential. Today in the Permian Basin, Chevron is targeting these stacked plays above and below the rock layers from which we have produced for decades. Application of horizontal drilling, combined with hydraulic fracturing, enables the economic development of these previously inaccessible resources. The stacked plays enable efficient development and production from multiple zones. They also allow for multiple wells from a single pad location using our shared infrastructure. "We are fortunate we have been here for a long time, and been here consistently. We are experiencing a renaissance in the Permian Basin today, and we expect to be here for decades to come." We sign leases for new land or work on existing acreage and secure permits from regulatory authorities. Our earth scientists and engineers use well and seismic data to understand the prospective geologic formations and appraise the size of the oil and gas deposits. Our teams plan for the full-life development of the oil and gas fields. We then create development projects for specific areas of the field and get approval for funds to develop. We build a well pad from which we can drill multiple wells. We use a rig to drill thousands of feet down. We may drill vertically or horizontally in the oil and gas deposit. We use hydraulic fracturing to free oil and gas trapped in tight rock. Fracturing a well takes a few weeks while the well produces for decades. Gathering lines are built to carry the oil and gas from the wells to a pipeline system and to market. We have been producing oil and gas from these wells for decades. We minimize land use by using one central battery for several square miles of producing wells. When the well stops producing, we plug it with cement at multiple depths to permanently seal it, remove all producing equipment, and restore the surface to its natural state. The growth of shale oil and tight gas in the Permian Basin calls for a new development approach we call the “factory model.” Through this more consistent, repeatable and higher-velocity process, we have tripled the pace of our drilling program. The manufacturing-style focus of the factory model enables us to accelerate development by prioritizing, faster than ever, prospective well locations from thousands of opportunities across Chevron’s Permian Basin acreage. The approach has lowered drilling costs, reduced the number of days from start of drilling to first production and increased the number of wells each rig drills. Did you know? During World War II, the Permian Basin produced 25 percent of the world’s oil. 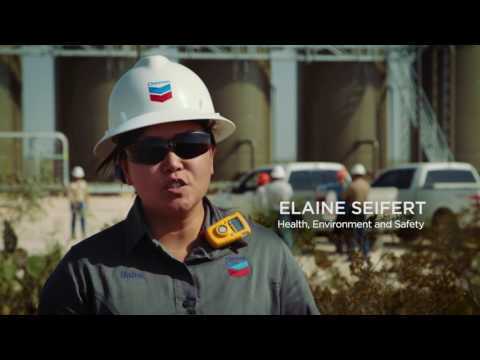 Throughout Chevron’s operations, social investments are integral to our approach to doing business. Our primary focus areas are improving the quality of education, especially science, technology, engineering and math (STEM); promoting economic growth; and creating healthier communities. Here are some examples from the Permian Basin. Chevron’s Take 2 program is providing job training to scores of low-income residents of Midland and Odessa, Texas, helping to break the cycle of poverty by enabling them to gain employment in high-paying areas such as truck driving and nursing. Since 2011, Chevron has supported the instrumentation and process control technology program at Odessa College. The program trains students to become highly skilled technicians for the energy industry. Chevron also provided subject-matter expertise to develop the curriculum, recognizing that the work in our industry has changed and will continue to do so. Investing in the program today helps develop innovators for tomorrow. To help conserve the Permian’s valuable resources we seek to use more brackish than potable water, targeting deeper aquifers that contain water not suitable for human consumption or agricultural usage. We use centralized water facilities and pipelines to reduce truck traffic and associated emissions. We recognize land use as an important issue to local stakeholders and address it through Chevron’s Environment, Social and Health Impact Assessment process. To identify areas of potential environmental, geologic or archaeological sensitivity, we employ early pre-drilling/planning activities. To minimize our footprint, well pads, access roads and facilities are located to reduce potential surface impacts, and horizontal drilling is employed to produce more with less surface land use. Centralized infrastructure such as roads, pipelines and hydraulic fracturing ponds further reduce our footprint by serving multiple well pads. We work with landowners to limit potential impacts to farming and ranching activities and work to avoid sensitive areas, like archaeological sites and habitats of threatened and endangered species. Chevron took a leadership role on behalf of the industry in West Texas and New Mexico to protect the dunes sagebrush lizard, a species unique to the Permian Basin. Through a voluntary conservation agreement, we committed more than 50,000 acres of our oil and gas holdings as protected habitat. Some of the steps taken to protect the lizard included removing old drilling pads, roadways, fence lines and power poles to prevent habitat fragmentation. We design and construct facilities to operate reliably and minimize emissions. We verify and maintain asset integrity through an inspection and maintenance program, and we voluntarily conduct other environmental stewardship activities, such as infrared camera surveys and installation of low-emission equipment.